Imagine that you are a startup PR firm, at a time when the word startup didn't have quite the same cache it does now. Imagine then pitching to an iconic IT firm and facing their storied set of founders across the table. With a total bench strength of 3 people in your company. That's exactly what Nandita Lakshmanan, founder and chairperson of The PRactice ended up doing early on in her life as a PR entrepreneur. And if you haven't guessed already that firm was Infosys, a pitch Lakshmanan and her team won in a 30-minute meeting. This year marks 25 years for Lakshmanan in the PR business and 18 years of 'The PRactice'. Lakshmanan shares her life story and lessons from her journey. Nandita Lakshmanan says her foray into setting up her own firm was not planned. In October 1999, Lakshmanan started consulting after quitting Genesis. One of her first few clients was Acer, which had just broken away from Wipro. This opened the door to other mandates, including one with Grey Cell Technologies now called Unimobile. Lakshmanan was, therefore, able to ride the first wave of IT startups. Lakshmanan says that while she worked with start-ups, it was always with caution. Commenting on the current rush for offering PR services for startups Lakshmanan says, " I am not enamoured with the start-ups. There is too much money being thrown about, there are huge marketing plans and not convincing business plans. I am hugely cautious, I wanted to work with companies that would last, that have longevity." Nandita Lakshmanan says, "We must not undermine the power of PR. We do have the power and can impact decision making at the very top. PR is the only function that takes a 360-degree view of the business. So go in with that kind of confidence. We are helping build a business, keep that in mind"
Lakshmanan adds that " I come from a family of journalists and I have always felt proud of being in PR. 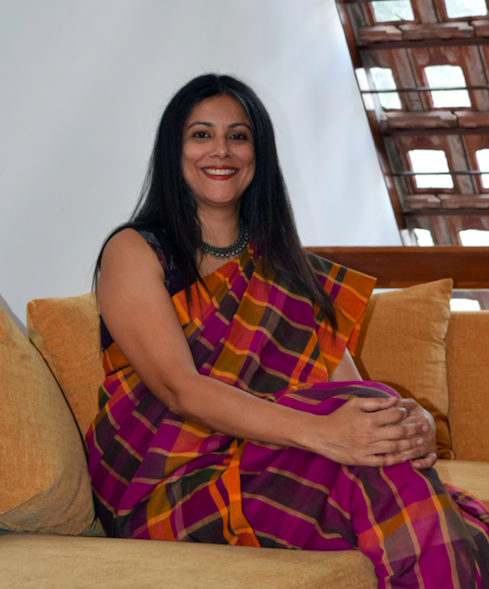 My first bosses were Prema Sagar and Archana Jain; when you see people like them hold their ground, it helps build your own self-awareness and confidence." Lakshmanan also pointed out that while in PR a lot of emphasis is laid on relationships, it's also important to remember that discipline and learning are also key to being successful at PR. In April 2014, in a rare move for founder-owners in the PR business in India, Lakshmanan handed over the reigns of 'The PRactice', to current CEO, Vivek Rana. Lakshmanan says rather wryly that it was a mid-life crisis that led to the decision. She says, " All my senior leadership team members at that time, were 10 to 12 years in the firm and it is good to make way for the next phase in life. It was time for them to experience being at the helm." "To show outcomes for digital needed a younger leadership team. I do keep myself abreast, but I have a team that was passionate about the digital challenge. I would be limiting the organisation if I would continue to stay. There was a need for me to do something different." The PRactice continued to handle the Infosys mandate for 12 years, but not during the 2016 clash between the promoter and CEO. Sharing her reaction to the very public battle, Lakshmanan says, "It pained me a lot to see what was happening, these people are the architects of corporate India. It was distressing to see how opinion was overlaid over the developments. In the age of perception and fake news, it has to be taken with a lot of scepticism." Lakshmanan adds that " Infosys is a company that is built on very strong values and unless it was shaken, it wouldn't have come to this. We all live in glass houses. We have to be very careful about how we behave." As we wrap the interview, Lakshmanan shares her business philosophy. She says I believe that "Topline is vanity, cash flow is reality and the bottom line is sanity!" Lakshmanan says they have never resorted to borrowings and have always been profitable." She says, "The size of our office doesn't matter to us, our values and growth does."